CHICAGO, Jan. 22, 2019 (GLOBE NEWSWIRE) -- Allscripts Healthcare Solutions, Inc. (Nasdaq:MDRX) will report its financial results for the three months and full year ended December 31, 2018, after the close of stock market hours on Thursday, February 21, 2019. Allscripts management plans to host a conference call and webcast to discuss the company's earnings and other information at 4:30 p.m. Eastern Time that same day. The Allscripts earnings announcement will be distributed immediately after the close of regular stock market hours on February 21, 2019. The announcement will also be available at Allscripts investor relations website. To listen to the conference call, participants may log onto the Allscripts Investor Relations website. Participants also may access the conference call by dialing (877) 269-7756 or 201-689-7817 and requesting Conference ID # 13686664. 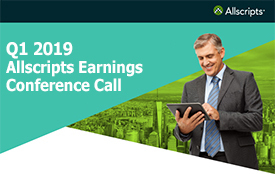 A replay of the call will be available approximately two hours after the conclusion of the call, for a period of four weeks, on the Allscripts investor relations website or by calling (877) 660-6853 or (201) 612-7415 - Conference ID #13686664.